– shadow catcher plate with composited background rather than usual studio floor setup, effectively not generating banding. Share the post "Pet Project: Hugo – Base Mesh Turnaround"
The purpose of this project is to explore the giclée printed medium. ZBrush sculpt, screen capture – WIP. 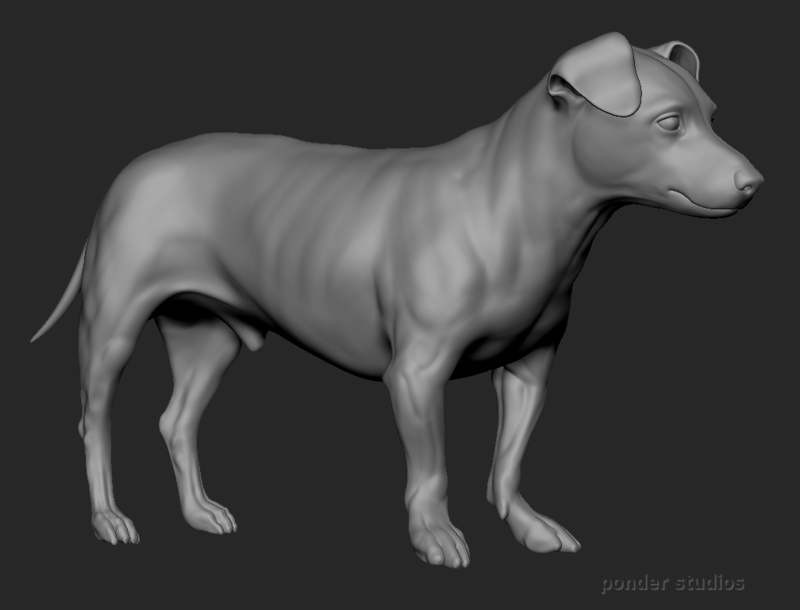 Share the post "Pet project: Hugo, a Jack Russell Terrier – WIP"
Blenderella, Advanced Character Modeling Workflow on YouTube! Blenderella, Advanced Character Modeling, originally released in 2011 as a training DVD for Blender Institute. Share the post "Blenderella, Advanced Character Modeling Workflow on YouTube!" We finally moved our rendering pipeline over to cloud providers. 240 frames at 1920×1080 with cycles, split into 20 regions per frame. Rendered files stored using Google Cloud Storage. Average time per frame would be better if “aws” machines performed normally while using free tier instance. More details below. bx – IBM Bluemix – 1 month trial ?! Only provided a Kubernetes cluster with 1 worker node in their free trial. Since we required access to many VM instances, integration to render pipeline was postponed for now. @ 0:15 seconds, we can see the CPU taking 9-10 more time than all other providers. Share the post "Monitoring blender cycles render"
Dragon baby Scales silver pendant. Dragon Baby Scales, blanketed by his wings. Share the post "Dragon baby Scales silver pendant." Sintel & Scales models created with Blender. Share the post "Sintel & Scales 3D print"
Sad Sintel model created with Blender. Share the post "Sad Sintel 3D print"
Share the post "Seated Male Figure 3D print"
Share the post "Blenderella 3D print"
Share the post "Welcome to Ponder Studios"